Originally best known for releases such as PSyKo SEVEN and Project805, Ventura Cigar Company has been rapidly gaining a foothold in craft cigar circles around the country in recent years. This is due, in no small part, to the clutch acquisition of industry visionary Michael Giannini (now acting as general manager). In the same time period, the company introduced perhaps their most exciting series to date with the Ventura Archetype. 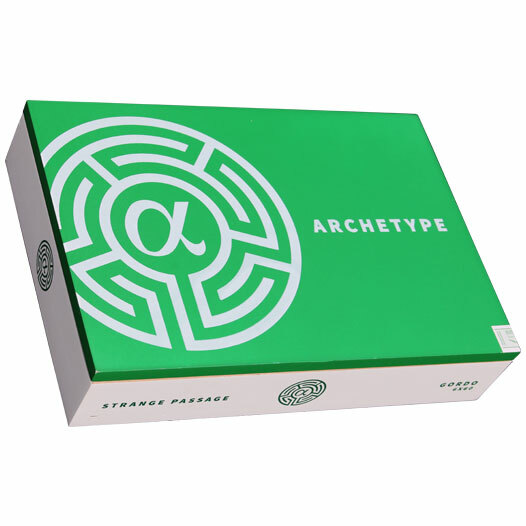 Archetype is made up of five unique cigar blends that are produced at three major cigar factories, spanning three countries. These five cigars are broken into two collections, which Ventura dubs "Chapter 1" and "Chapter 2." Chapter 1 cigars are produced at Davidoff's Occidental Kelner Cigars factory in the Dominican Republic and Diadema Cigars de Honduras factory in Honduras. Meanwhile, cigars in the Chapter 2 collection are rolled at Drew Estate's renowned La Gran Fabrica Drew Estate factory in Estelí (a stat that few other companies can boast). Archetype Strange Passage is one of three cigars in the Archetype Chapter 1 series. Strange Passage is rolled at the modern Diadema Cigars de Honduras factory (aka Camacho factory) in Honduras. This is a full-bodied blend rolled by the company known best as the "Bold Standard" in the world of premium cigars. A very rich Ecuadorian Habano wrapper has been selected; this is draped over a Honduran Corojo binder and an undisclosed filler blend from multiple countries. The end result is a full-bodied smoking experience, hitting the palate hard with classic flavors of cedar, leather, black pepper, freshly roasted coffee, and a nice sweetness of dried fruit as the perfect complimentary ingredient.